There's something about friendly service and sunny cafes that really draw me back again and again. It's even nicer when you can plonk down with good book or the paper and sit for an hour or so. Most like you to keep moving - not Icoco's! Located close to Milsons Point train station (over the road), the sunny outlook is favoured by locals. Also, their brunch menu is outstanding. I imagine it won't be a secret for much longer. With a french theme decorating the interior of the cafe - it's a pretty little (and quiet spot). I ducked in for lunch and as I'm incredibly partial to omelette's - it's hard for me to go past all day menus or this style of lighter fare. One thing is for certain with Icoco's - bring your appetite. The meal sizes are generous. Fresh button mushrooms and lovely smoky chorizo filled my perfectly folded and golden brown omelette. 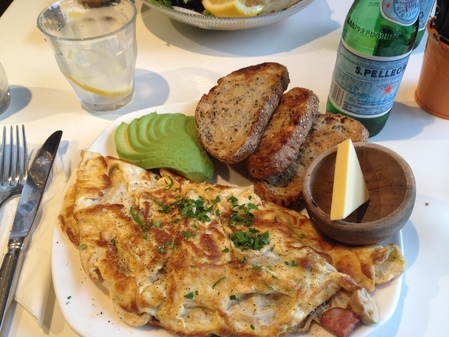 The texture of the two was savoury heaven and I loved how fluffy the omelette was. I lathered my baked soy and linseed bread with avocado and the last one with a good smearing of butter - yum! Topped off with light sparkling water with lemon slices, I felt completely satisfied and happily full. If in Sydney and around the area, this is a charming spot for an extended brunch or one hour lunch if you are an office worker. The service is pretty fast. Insider tip: sit by the window if you can. It's a treat to watch the world go by.